NEW DELHI: The maiden Derby clash took place on 28th May, 1925 at the CFC ground (Mohun Bagan Ground) where East Bengal defeated Mohun Bagan 1-0 in the Calcutta Football League. The winning goal was scored by Nepal Chakravarty. The exchanges in the match were dominated by Mohun Bagan but the East Bengal custodian Purna Das had an outstanding match. The first Derby to highly pitchfork the ‘Ghoti’ – ‘Bangal’ rivalry was held on 9th August, 1945 in the IFA Shield Final which again East Bengal won 1-0 – the goal being scored by F. Pugsley. The match was held in the background of the influx of refugees from East Pakistan. The first time the two rivals met after boots were made mandatory on 26th June,1954 in the Calcutta League, Mohun Bagan beat East Bengal 3-1. Runu Guha Thakurta, P.Venkatesh and Samar Banerjee scored for Bagan while Ahmed Khan reduced the margin for East Bengal. The first time the Derby was held outside Kolkata was on 28.12.57 in the Semi Final of the Durand Cup at New Delhi. The rivals played out a barren draw. In the replay held two days later, East Bengal won 3-2. Tulsidas Balaram, Balasubramaniam and Moosa scored for the winners while Chuni Goswami and N.Mukherjee reduced the margin for the losers. On 22nd July, 1961 East Bengal won the Calcutta Football League after nine years and for the first time since boots were made mandatory in 1954 when they defeated Mohun Bagan 1-0 courtesy Tulsidas Balaram’s strike. On 10th December, 1964 in a high pitched Durand Cup final before the then President Dr S.Radhakrishnan, Mohun Bagan defeated East Bengal 2-0 with goals from Arumanayagam and Ashoke Chatterjee. In the background of the Indo-Pak war, the rivals played out a goalless draw in the IFA Shield Final on 22nd September, 1965. The replay was fixed by the IFA four days later but East Bengal requested for a further postponement of a day as the replay would have clashed with the AGM of the club. IFA rejected their appeal and Mohun Bagan were awarded the trophy following a walk over. 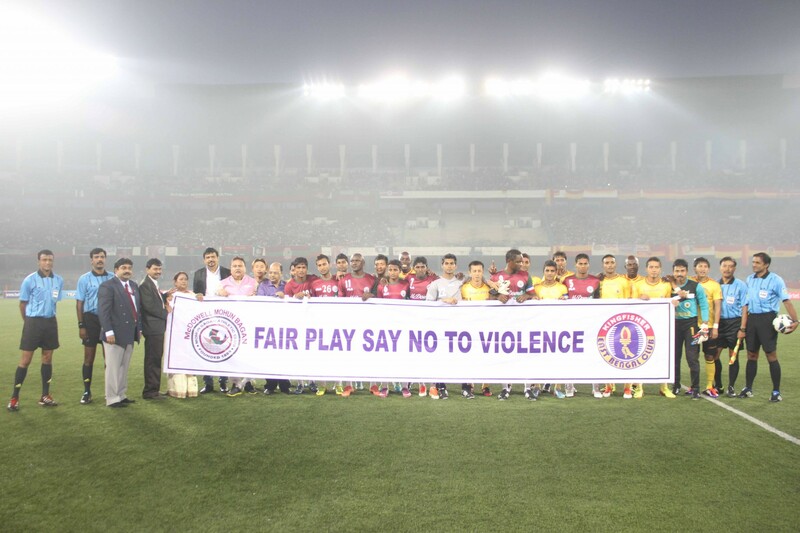 Bagan officials refused to accept the trophy and returned the same to IFA insisting on a replay. The match was rescheduled on 16th October,1965 and East Bengal won through a last minute goal by Ashim Moulick (1-0). On 30th September, 1975 East Bengal defeated arch rivals Mohun Bagan by a record margin of 5-0 in the IFA Shield Final. Following the match, a Mohun Bagan Fan committed suicide. On 24th April,1976 Mohun Bagan beat East Bengal 1-0 with a goal scored in 17 seconds by Mohammed Akbar. On 6th August,1978 a funny incident occurred at the Derby in the Calcutta League. In the previous Derby of the League, Mohun Bagan who had entered the field first had lost 2-0. Accordingly, keeping this in mind none of the teams wanted to take the field first and the Derby was delayed. After 45 minutes from the kick off both teams entered the field together. Mohun Bagan won 1-0 via a superb back volley goal by Shyam Thapa. On 16th August, 1980, 16 people died at the stands after fight between the rival fans. An onfield incident on the ground owing to a foul and a subsequent send off sparked off the trouble. On 13th July, 1997 East Bengal defeated Mohun Bagan 4-1 in front of a capacity crowd of 1,25,000 at VYBK in the Federation Cup Semi Final. Bhaichung Bhutia scored a hat-trick in the game. On 15th April,2007 the Derby of NFL was witnessed by FIFA President Sepp Blatter. Mohun Bagan won the game 2-1. In the first Derby clash of the I-League on 30th December,2007 Mohun Bagan won 1-0. On 25th October,2009 Mohun Bagan defeated East Bengal 5-3 in the Derby. Chidi Edeh scored 4 goals. The two teams have met 309 times in all competitions so far. East Bengal have won 117 times. Mohun Bagan have won 86 times. The two teams have met 34 times. East Bengal have won 14 times. Mohun Bagan have won 10 times.